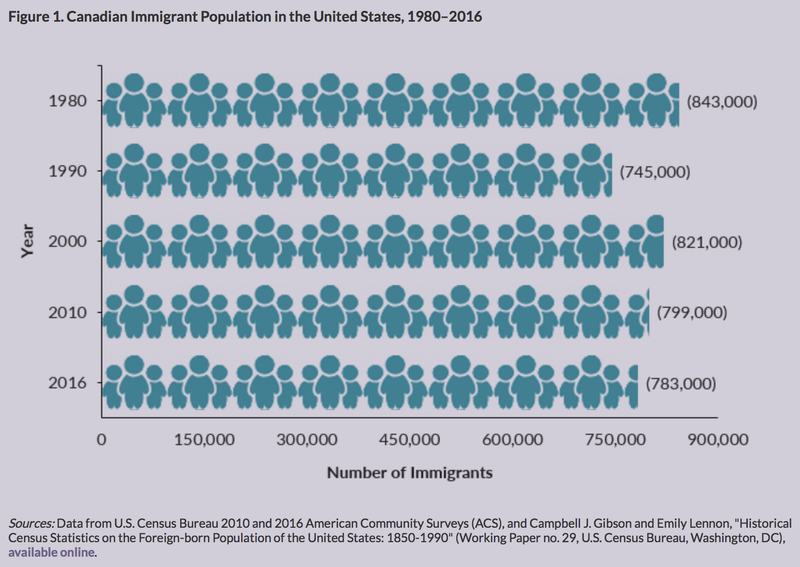 Canadian migration has generally been a small share of immigration to the United States, historically fluctuating according to economic factors in the two countries. In 1960, Canadian immigrants made up about 10 percent of the total U.S. foreign-born population. Though the number of Canadians in the United States has decreased and levelled off since then, this population has grown more diverse, and today includes students, family migrants, skilled professionals, and retirees. As of 2016, about 783,000 Canadians lived in the United States, accounting for less than 2 percent of the roughly 44 million U.S. immigrants. The motives of Canadian migrants have changed over time. Beginning in 1867, migrants from Eastern Canada came to the United States to work in the burgeoning manufacturing sector. In 1900, the U.S. Census recorded 747,000 English-speaking and 440,000 French-speaking Canadian immigrants. The two groups settled in different regions: Most Anglophone Canadians took up residence near the border, in states such as Michigan, New York, Massachusetts, Illinois, and Rhode Island, allowing them to easily move between the two countries, while Francophone Canadians largely moved to New England and California. French Canadian migration increased between 1900 and 1930, driven by discrimination as well as poor economic conditions in Quebec. After 1930, increased political autonomy for Quebec and the growth of the Canadian economy following World War II led to a steady decline in Canadian arrivals. In the second half of the 20th century, Canadian migration shifted and diversified significantly, especially after enactment of the North American Free Trade Agreement (NAFTA) in 1994. Canadian immigrants now include highly educated professionals, students, those seeking family reunification, and “snowbirds,” people in or near retirement attracted by warmer southern climates. Canadian students are the fifth-largest group of foreign students enrolled in U.S. higher education, and high-skilled Canadians receive the third-largest number of employer-sponsored H-1B temporary visas. Many Canadians also come to the United States on NAFTA Professional (TN) visas to work in a variety of professional occupations, although the exact number is unknown. Click here to view an interactive chart showing trends in the size of U.S. immigrant populations by country of birth, from 1960 to the present. The United States is by far the top destination for most Canadian emigrants, with others settling primarily in the United Kingdom (92,000), Australia (57,000), France (26,000), and Italy (26,000), according to mid-2017 estimates by the United Nations Population Division. Click here to view an interactive map showing where migrants from Canada and other countries have settled worldwide. Most Canadians in the United States who obtain lawful permanent residence—also known as receiving a green card—do so either as immediate relatives of U.S. citizens or as employer-sponsored immigrants. Compared to the overall foreign-born population, Canadians have a higher median income, are less likely to live in poverty, and are more likely to have health insurance and to be college educated. They are significantly older, on average, than the overall immigrant and U.S.-born populations. Using data from the U.S. Census Bureau (the most recent 2016 American Community Survey [ACS] as well as pooled 2012–16 ACS data) and the Department of Homeland Security’s Yearbook of Immigration Statistics, this Spotlight provides information on the Canadian population in the United States, focusing on its size, geographic distribution, and socioeconomic characteristics. Note: Data from ACS and DHS represent persons born in Canada; they do not include immigrants born outside of Canada who then gained Canadian citizenship via naturalization and later moved to the United States.